HDFC Bank Regalia Credit Card is one of the most popular premium credit card in the country for many years. Most of the premium credit cards that we have now were all designed after the success of this legendary card. However, it lost its name & fame as it went through series of devaluation in recent times but now HDFC has added new set of benefits to make it shine again as it always used to be. Lets have a look at this card in its newest form as my previous review is quite old now. Note that this is the Original Regalia and do-not get confused with the Regalia First, which is one step below this card. So if you’re able to spend 8 Lakhs in a year, you can get reward rate as good as 2.2% – which is good, but i wish they had designed it to achieve the 2% reward rate as it used it to be in the past. Now this is where the Regalia credit card shines. Every now and then HDFC runs offers with various merchant to give you 2x/5x/10x of the regular points which multiplies the reward rate so well. I was fortunate enough to earn 27,500 Reward Points in a month years ago, but now they’ve put very low upper cap on most promos that it gets really hard to rack up points like in olden days. Note that Business Variant has separate set of 10X partners, but upper caps are everywhere! Redemptions are easy and I’ve myself used Regalia Points to book a trip to Vietnam – typically saving 25,000 INR using points. Note that most of the Visa/MC limits are set to every quarter, but with Regalia its an yearly limit, which is great indeed. HDFC Preferred Banking: If you’re on Preferred Banking for >6 months with good Balance/AQB, you’ve higher chances to get Regalia if above condition is not met. Upgrade: Limits above 3 Lakh on existing HDFC card (Regalia First/Allmiles) with good spends would help. 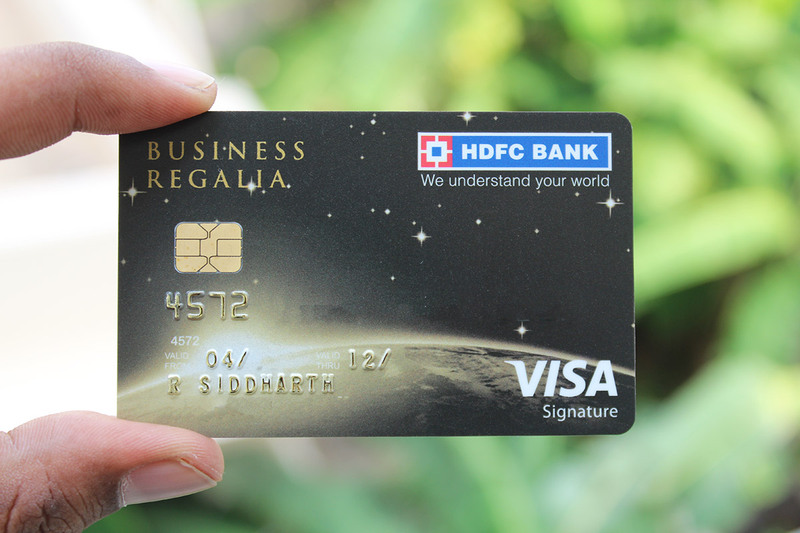 HDFC Regalia is undoubtedly one of the wonderful credit card of our generation. Its so much popular that the guys operating airport lounges know it when you say “Regalia” rather than Visa Signature or Mastercard. I would have myself literally seen 100’s of Regalia Cardholders swipe their card for lounge access. I was holding this card before i switched to HDFC Jet World (Signature) and some of you might be holding Regalia even now. While the Regalia with decent reward rate is good at its current position, it could be much better if the default reward rate is pushed a little more. Whats your take on HDFC bank Regalia Credit Card? Feel free to share your thoughts in comments below. Upgrade from Regalia First seems a bit difficult to get. Even after high spends/Preferred banking? 3 to 4 lakh spends per year on this card. Didn’t get the upgrade, so switched to amex cards. Don’t have preferred banking but have savings account. I have a big confusion, I am using HDFC Moneyback it gives me 2points on Rs 150 spends and 4 points on Rs 150 for online transactions. Each reward point can be converted into cash at 0.20% . It also gives me 500 Rs cash voucher for myntra every quarter on spends of RS 50,000 for each quarter. I have been given numerous options to upgrade to Regalia First but I am reluctant to do so since Regalia points in my opnion can only be spend on Flights and Hotels and I am a less of travel person. Please guide me if I am right or wrong. Hi Sid, I think on spending 8L, you will earn 2.2% (~21000 regular spend based points + 15000 milestone points). But still, for a premium card, 2% is still very low. I am a frequent traveler and prefer the Citibank cards which 3-4 times in a year will collaborate with MMT to offer crazy cashback deals. If one includes these benefits, the return rates shoot up significantly. Also, I like the AMEX milestone rewards. They offer genuine value and that is the reason it is my go-to card nowadays. True, recent Citi MMT hotel offer was like 50% – Great value there, yet renewal fee is not being waived on Citi PM right? Yes, Value out of Amex cards as a whole equals to Super Premium cards. With respective to reward points and redemption, don’t you think Yes First Preferred has an edge over HDFC regalia? Looking at redemption options alone – Yes! Siddharth How is Yes Better in this as they have .25 redemption value for RP. ?? ?while regalia hai .50 redemption value . Yes First Preferred: 8 rps per 100= 2%= Flight/ Hotel + GV redemption also. Though now they don’t have Amazon GV in their options which was great. HDFC Regalia : 4 rps per 150= 1.33%= Only Flight/ Hotel booking is worth the value. If the case, the bank is not issuing me Regalia and I hold Diners ClubMiles, how do you see my current card? I understand that apart from a few lesser airport lounge accesses, there isn’t any difference between the two. Both have even the same reward rate. How do you see the difference? Should I still try to get hold of Regalia desperately? P.S: I don’t see any issue with acceptance of Diners now in Bangalore. ClubMiles is better with its 10X! Clubmiles gives you more value when you convert your RPs to airmiles ( 1RP = 1 airmiles). My spend is 3L on yes first preferred and income is >40l. I also hold regalia. I hardly use regalia. There is emi for 12 month which ll be done in another 3 months. I hold both of them for more than a year. Can I get upgraded to yes first exclusive or regalia to dinner club black? You can easily get diners black…..contact any branch and fill the form with income documents. Approach your bank manager. You can even get invited for Infinia. But getting Diners Black shall be easy for you if you hwv a current credit limit on your existing Regalia, more than 3-4L. Getting YFE through income documents is little difficult for your ITR, it’s worth giving a try. Insist on getting a life time free version. 5 lac is the required limit for upgradation to DCB and 8 lac to be invited for infinia. My money Back (CL Rs.75,000/-) was upgraded to Regalia First during Nov.2017 with the CL of Rs.4,75000/-. I spent around 13 lakhs and I was offered Regalia during Aug.2018. I’m a classic account holder. They’ve increased the number of domestic lounge visits but seems the list of lounges is shorter than last year. Do the add-on cardholder need to apply for a separate priority pass for international lounge access? What about the complimentary domestic lounge benefit for add-on card holder? There is no complimentary domestic lounge access for Add-on card holder, And yes you need seperate Priority Pass for Add-on card holder for international lounges. Domestic is only for primary and not for Addon. does regalia first also has lounge access for addon card like Regalia? How to get business regalia? I currently have reglaia first. I have savings a/c with hdfc and classic member. current limit is 3lakhs. Why would you want Business Regalia? Usually business variants don’t receive don’t receive targeted offers etc. You should upgrade your regalia first to regalia. I am holding Diners Premium with limit of 3.90L. Current 10x partners are of no use to me to avail 10x benefits whereas i can easily spend 8L in an year for the 2.2% reward rate. Do you think i should get it upgraded to Regalia or stick to DC Premium or upgrade to some other variant? Domestic lounge facility is for both primary and add on cards also. Shared among the cards. I hold diners rewardz card with a limit of 1.72Lakhs for over 2 years, have a corporate salary account for over 2 years, and In-hand salary is over 67,000 Rupees. Apart from that, I have a personal loan of 2 Lakahs with them with 12 EMIS paid, always on time. 2)Does the add-on cardholder have free domestic longe access? I want to share my HDFC CC experience with you. I got a call from Telecaller (Aalia shaikh) and she offered me HDFC Regaliaa card with No joining and annual fees with lots of benefit( Bye one get one free offer on Book my show) . I was ready for this and submitted my documents and after few days they directly dispatch card to my address. Once I opened that is Dinner club miles card. I don’t want this card because there is no offer on Book my show with this card. Can you please tell me how I cancel this card? preffered account with high NRV may help. Which card to use for Delhi T2 Plaza premium? Any Mastercard World variant of debit/ credit cards, selected Mastercard platinum variants ( Check respective offers in their t&c), Diners Clubmiles/ Premium/ Black variants, select Rupay cards and ofcourse PP will do. How do I apply for an add on regalia card and pp for my wife. CC told to apply online. But I don’t see such an option. I don’t have a hdfc account, so only have credit card login. should i go for hdfc regalia OR citi premiermiles ?? 1. What are your needs? What kind of rewards are you looking for? 2. I believe HDFC Jet platinum card which you are referring to is Credit card. You can only have 1 credit card from HDFC in most of the cases. If you have upgrade option available based on your spends or income, You can upgrade to Regalia. travel benefit wise is regalia better or citi PM ?? Reward rate of Regalia is lesser than Citi Premier Miles but regalia will be helpful when you use 10x reward points offer in Smartbuy (Flipkart, Amazon, Flight tickets, hotels). Citi PM doesn’t have such high accelerated rewards but it has very good merchant offers like HDFC too. Citi gives lot of offers with Makemytrip and other travel websites too. I also hold Amex Travel Card which is my primary card. Once i cross threshold of Rs.4,00,000/- spend, i would then start using my next card which would be either one of the 2. How much more do you expect to spend in a year? If you’re halfway there with 4L, you may also get an Amex Payback card which gives 7000 Flipkart voucher on 2.5L spend. Once done, go on to Amex Gold Charge and work for 10K statement credit. To win anything reasonable at points game, you either have to have much higher spends (15L +) or you must be exploiting multiplier offers. If neither of those are true, stick to threshold cards. Any idea why AMEX is not rewarding for insurance transactions while all the others do. I know they run some promotions which gives cashback on LIC payments but regular rewards are missing. Folks, I need some feedback regarding an offer my RM is making. I am a preferred customer and my wife’s saving/FD is attached to my preferred status. She isn’t working currently and has no income of her own since three years. RM called yesterday offering a LTF Regalia to my wife. 1. I already have a Diners Black, Yes Bank Exclusive (LTF) and AMEX Rewards (LTF) and my wife has the add-on card for all of these, including the PP on YBE. 2. This Regalia, if we go for it, won’t be used at all. 3. Is a new line of credit worth it? Given that we have no loans and have always paid CC balance in full. Hey PM, if it’s LTF, I don’t see why you shouldn’t go for it. Good to have a line of credit even if you don’t use it. Hi, Is there any credit card which offers lounge access to both primary card holder and addon card holder at the same time and in the same lounge? Ultimate does not provide for add on in domestic and for international also 1 has to spend 20k on each card for lounge access. Your reviews are always great. There is one update on add on card. I have used Regalia primary card and add on card at the same time last week in Hyderabad Airport. For info. Tell me which card gives unlimited lounge access . Received Regalia cc on upgrade from 1 year old Regalia First cc. CL enhanced by approx. 40%. BM/ RM tried his best for DCB but unsuccessful. Will try again for DCB after 6 months. CL Enhancement, I tried in multiple ways for limit enhancement thru RM, Branch Manager and sending letters to credit limit division in Chennai. But all in surprise, today i book flight ticket from smartbuy for 80K for my trip to Sydney, they called me for transaction inquiry and increased limit from 3.6L to 9.7L… Huge limit enhancement. Also, i notice my friends Regalia cards been upgrade to Infinia in recent past once after their credit limit enhanced. I confirm same with 2 of my colleagues. How many add on cards can one activate on this card? And can one use all the associated priority pass cards on a single day at the same international lounge? You can get 3 add on cards per HDFC card. Yes. You will be able to use all PP cards at the same time in a lounge. Please note that the combined limit for all PP visits in Regalia card is 6 per calendar year. Just wanted to correct this error I just tried to use two PP’s “Prim & Add-on” in one lounge and it did not work so had to use an alternative but for sure you cant use two PP’s in the same lounge. How are these reward points calculated? If terms say that maximum is 25,000 reward points a month, is this before 10x reward points or after as the extra points are anyhow credited after 90 days? So if i spend Rs 5,00,000 I would be eligible for 13,333 points (5,00,000/150*4) immediately but with 10x reward points I would be eligible for an additional 119,997 reward points (133,330-13,333). Could you please clarify how this works? I think you will get 25000 points max (with 10x),if you spend lump sum, whenever those points get credited. This is assuming 10X points on smartbuy for flight tickets for eg. Does it work like that? Anyone? You don’t get RP for EMI transactions. It’s stated in HDFC TnC! I also confirmed with concierge that it works. Since how long you are holding hdfc bank credit card ? I been holding HDFC credit cards since 2009. How do I book premium economy flight tickets on hdfc regalia website? They have options only for economy/business/first class. Concierge also unable to help. You can only book the class which is mentioned on that site. Else, you need to book Premium Economy from the flight’s own site and not through HDFC Regalia. Issue is I want to book the ticket by redeeming my points. I had sent a mail requesting them to incorporate premium economy in flight booking options. They replied like they are working on it and in the meantime, we can call them to book premium economy tickets. As such, calling the customer care number should help us book tickets in premium economy. But I am yet to try it. Called regalia concierge. They couldnt help. Says they also have the three options only. No premium economy. Do I get 10x reward points if I book flights through the regalia website? Currently there is 10x rewards going in the hdfc smartbuy website. Which would be more beneficial if i immediately do not have points to redeem but hold the regalia card? 10x Rp no longer available for bookings through Regalia Website. 10x RP through HDFC smart buy gives you a 13.33% savings for Regalia and 33.33% for Infinia/DCB so that’s any day better! Just applied for Regalia yesterday. They offer it LTF if you apply for an add-on card or make one transaction through PayZapp within the first 90 days. I applied for an add-on card. I was confused between Citibank Premier Miles and Regalia, opted for Regalia since it was free anyway. The problem is I want a no nonsense card and want to basically just move all my debit card expenses to primary and add-on card, concentrate all expenses in one place. I have never used a personal credit card before (except for Corporate cards) but I realize I can still stand to earn some more through reward points even I was to not chase them intentionally. Shall I go with Citibank Premier Miles or stick with Regalia? I do use Big Basket and Amazon a bit more than anything else and Regalia does have 5x / 10 x points but I am not sure if Smartbuy offers the same convenience as shopping through Amazon app for example. A citi card is good to have if you shop regularly on BigBasket. If not PM, you can get entry level one with fee waiver on spending Rs. 30k in a membership year to avail all Citibank offers. I have Citibank Cashback card. For bigbasket Citibank 20% offer every month 1st to 5th day is among the best. For amazon Regalia via smartbuy is very good. Citi also runs frequent offers on amazon. I suggest better keep Regalia and apply for any basic citibank card among Cashback, Rewards or Indian Oil variant just to use their often good merchant offers. They don’t charge fee on above variants if spent 30K within year, which is damn easy. I am planning to upgrade from Regalia to Diners Black. What happens to Milestone based reward points (10,000 for spending 5 lacs and 15,000 for spending 8 lacs)? I recently completed spending 5 lacs but 10,000 reward points haven’t been added yet. Are they added only after completing the Anniversary year? Will I lose them if I upgrade now without completing anniversary year? Are they added only after completing the Anniversary year? Used to. But now, they’re doing monthly. Check after a month or write to support. Update: I got them without completing the anniversary year. Hoping to get approval for Diners Black. Have been using Regalia for 2 years 8 months. Tried to access the new Earth lounge at the spanking new domestic terminal at Kochi using MC regalia. Was denied saying that regalia does not have access although they were welcoming other MC credit card holders. Any idea why? HDFC have revoked most of the lounges. So now they’ve made single list for Visa/MC. Just ignore this list. However, Regalia doesn’t work at some lounges temporarily, maybe as too many are holding it. Rupay platinum or rupay credit will work there instead of regalia? They have the same list of lounges as MasterCard, or even more. An acquaintance has got HDFC solitaire credit card with 8 Lakh limit on a 12 Lakh ITR under Preferred Programme with high NRV and HDFC is still refusing to upgrade her to Regalia! You’ve mentioned about “4 RP for every 150 INR Retail Spends” on Regalia. What qualifies as “Retail Spends”? How many reward points will one get on spends other than “Retail Spends”? Even HDFC bank mentions this “Only valid Retail purchases qualify for Reward points”. I think this is quite confusing. Will I not get reward points for bill payments? PS: Recently got upgraded to business regalia from business regalia first. Can I redeem my points on regalia to miles? If yes, then what is the conversion ratio and how to do it? I got my first credit card (Regalia First) in November 2018. I’ve accumulated about 15k points, but seeing the low points value, I want to upgrade to Regalia. 1) With a 9L salary, am I eligible for Regalia? 2) Will my reward points get transferred to Regalia? Minimum time of 6 months is required for upgrade request. Chances of upgrade depends upon several factors like NRV with bank, Savings balance, FD etc. Income is one of the criteria to upgrade to regalia. My income is half of yours. Few days back i got auto offer. My spends were very high along with preffered relationship both help system to get triggered. Hope this helps! Himanshu how old is your card and how much is your annual spends ? How much money you maintain in your preferred ac. and do you have any other investments ? Regalia first was 2 yr old card. Annual spends over 8L+ . Account balance is around 2.5 lacs. No other investment. Hi, i am looking to get a credit card for online purchases and occasional online travel, and fuel. What brand (hdfc, amex) and which card (regalia first ) would you recommend? My salary around 23 l, so for the above mentioned headings, what producta should be looked at? I am having HDFC regalia first credit card and using the benefits of smartbuy for online shopping on Amazon and Flipkart. Recently, I booked my flights and hotels using smartbuy only as 10X offer was too good to miss. Hence, I was unable to utilize my rewards points on HDFC regalia first card. For fuel spends I am using SC titanuim value credit card. Since my fuel usage is less i.e. from home to metro station, it is suitable for me. For wallet loading and all other usages I am using Amex MRCC. In case some shop don’t accept AMEX, I use HDFC regalia first credit card. I also have SC Manhattan and Yes Bank prosperity edge credit cards. They are only for backup as they are LTF. You qualify for DCB. Get a DCB and shop via Smartbuy. Stick to Amex for fuel, or get a fuel card depending on your favourite pump. How to qualify for DCB? I am holding regalia and prefered status at HDFC. Annual spends over 10L on the card. Completed 5L milestone and got the 10k points also within 2 days of transaction. Is a bank account with HDFC required for regalia ? I applied online but the lady on the other side tells me that a savings bank account is absolutely necessary for Regalia. They are ready to give me Regalia First (1.5L limit) without savings bank account. I have 28 L Base salary and hold Kotak Signature ( 4.5 L limit) and Amex Rewards ( 2L limit). You qualify for Diners Black. Have heard about this recently from a RM in bank when i wanted to upgarde my wife’s regalia to diners black. Anyhow i have sent the upgrade form to chennai. U can open the account and close it after few months if they are admant, thats what i told the RM what’s the use if i close after 2 months. No, i don’t think so. Tho i am hdfc account holder but many do not hold. Maybe lady is misguidng. Check with other hdfc guy. If you have 28L salary. Straight away apply for Diners Club Black. Depends on the place of issue. Only the HDFC bank branch would be able to give you that answer. Does the PP come with a validity period. Or is it valid as long as I hold regalia cc? PP issued on Regalia has a validity of 3 years from issue date. So what happens after 3 years? Is it renewed or does the offer expire. No idea man, bcoz still 1.3 year old relation with HDFC, so can’t say that. Old HDFC Regalia holders may advice better or you can always talk to customer care. Thanks Sid for this wonderful blog. I have started using Credit card after reading this blog in 2018, collecting Air miles, Hotels reward points. I go for business travel to SFO/SEA/China every 3-4 months and stick to Singapore airlines whenever possible and last year alone I have collected ~1.3 lakh Krisflyer(which is equal to 3 round trip MAA-SIN economy tickets & Krisflyer Gold membership). I used to stay in different Marriot Properties(JW, AC, Westin, Sheraton, Courtyard, Aloft…) and and collected ~1.5lakhs Marriott rewards(Platinum member). Before reading this blog, I am not aware of these benefits and not bothered to register for any membership. In 2018, with Regalia spent around ~12 lakhs(Personal expense) and got ~2L points and with Amex MRCC, I have received 24 Carat statement credit. Much thanks to you and your knowledge sharing. Unfortunately, my company brought in Corporate Card policy last year. If I would have read your blog in 2017, my spending would be around ~40lakhs in my personal CC(Each trip expense is around ~7-8 lakhs excluding Air fare). even if you use corporate card for payment, I guess you can get airline loyalty points when booked directly. Hello Siddharth. I recently got upgraded to Regalia from Regalia first. When I received Regalia first CC, i received a separate Priority Pass card. I haven’t received it with Regalia. Do I have to apply separately or can i just swipe my HDFC Regalia card for complimentary lounge visit? Swipe your Regalia card for domestic lounges. Priority Pass is required only for International lounge access. If you want Priority Pass for Regalia, call hdfc customer care for the same. Thanks a lot for the info. Will do the same. You need to swipe/use your Regalia thrice before requesting a PP card. I have been offered for a card upgrade from regalia first to regalia and that’s why I landed here when I was trying to find about the benefits. There is an offer for an annual fee waiver of 2500 for regalia, which is to add any utility bill through smart pay and pay for 3 months. This should give me free lifetime membership. Just wanted to check here from experts if this is correct? Also, why redeeming points for getting items available in redemption considered not worth it as compared to flight/hotels? @ Harish – The LTF offers vary from customer to customer so just read the TnC of the card application form. Redeeming points against hotels/flights give you more value compared to redeeming against items. I upgraded from Regalia first to Regalia last year in November, 2018 after holding Regalia First for more than an year, got it in August, 2017. After upgrading, the rewards from Regalia first were transferred to Regalia. How does it affect the validity of my reward points after transfer? Will they expire in August, 2019 or November, 2020? The card has a spend based offer of 10K points for spending 5L before renewal. My card is due for renewal but I don’t know how much I am short of the spend. Few months ago it was showing it in my netbanking portal, not anymore. Anyway to check how much have I spent ? Just call the customer care they will tell you. Call up card customer care and ask them! Not 3 years. Just past 1 year. Monthly statements. Easy to access and add. I downloaded this new form from HDFC to upgrade my Dad’s Business MoneyBack card to Business Regalia Card. HDFC has now removed Life Time Free Option from the Form. Can anyone confirm whether we can still convert a credit card to Life Time Free through Add On card and Standing instructions or I am late to grab the offer now. As per my conversation with customer care and HDFC branch RM the card is not being offered lifetime free. Post devaluation of Yes First Preferred, I wished to convert my existing Regalia First to Regalia. You can get for FYF (First year free) and then Spend 3L on regalia for fee waiver. Has anyone upgraded recently from R First to Regalia? Does HDFC consider high CIBIL and good spends? Current limit on my R First is 1.85 only. I have good spends, CIBIL of 820, ITR of 12.5. But CU % is always high around 60%. First of all thanks to you and your website. I have learned a lot about how to use credit cards efficiently. I have a query and need your guidance, is there a way to get both Regalia and DCB. I am a holder of Regalia for the past 2 years and I have an opportunity to get it upgraded it to DCB. But i need Regalia as well due to its benefit for addon card. (Free lounge access +PP). As long as you have a limit of over 4 lacs on the regalia, it’s possible to get both regalia and dcb. They will just split the limit keeping 4 lacs for DCB and rest for Regalia. Thanks @RM. Ido have 4+ limit on Regalia. I will try to get to get them do the splitting as suggested by you. My colleague who has a little over 4 lacs credit limit on his Regalia card, his numerous attempts to get DCB as a co-card with Regalia have not been successful with about 3 sales executive including his original sales team. They either feign ignorance or say it’s not possible now. Since he has no relationship with HDFC bank maybe he has no RM who could help him out. I upgraded from R. First to Regalia two months back . My spends were high. Also i have preferred savings account with the bank they do consider high spending and cibil. Try sending form to chennai for LE+ upgrade if you are not getting offers. . As your ITR is 12 lacs they will easily give regalia. Well i had been using REGALIA FIRST for a year and a half. My spends would have been approx 2 to 2.5 lakhs. Had accumulated 35000 points and redeemed it for a voucher of approx 11000 rupees which is used to get a discount on my flight to Bali. I hold a HDFC Regalia CC for last 6-7 years with CL of about 8 lac. Also got Priority Pass for lounge access. Now I need one PP for my wife for use when we both travel abroad together. Should I take an add on CC for my wife on my Regalia or go for Regalia First for her. She is a housewife with FD of over 40 lac in other banks. One more Q, is there any Debit Card which gives international lounge access through complimentary PP membership? Just take an add on card. Make a few small transactions on the add on card within 45 or 30 days and then request for priority pass for add on card. Vineet congratulations. How much is your income if I may ask ? Well I am a doctor in a government hospital in delhi[ AIIMS] so I get around 130000 pm. My spends are not much. Maybe around 20k to 30 k in a month through credit cards unless I am taking a trip abroad. Vineet you spent only 2.5 lakhs in 1.5 years and got upgraded?? I was using HDFC jet platinum card for last 3-4 years and now I have recently got a call from HDFC chennai team to get an upgrade to Regalia or DCB. I am already using Citi PM card for travel purpose. Could you please help suggesting out of DCB & Regalia, which card gives more benefits in terms of travel & hotels. DCB is the best as of now of all the cards. You should go with DCB. Check out the respective article on DCB on the blog. @prashant I would suggest without any second thoughts go with dcb! Congratulations in advance for getting a super premium card!! Himanshu how much was you limit in Regalia first and now how much limit you have in Ragalia ? I applied for regalia via Branch executive. Met all conditions of card like an existing savings account, Salary, CIBIL score of 800+ but the card was declined. Somehow didn’t get a satisfactory response other than Policy guidelines. If I try to apply via Netbanking, I got the message “hdfc internal guideline e1002”. I had HDFC Platinum card, which I see in Netbanking and stopped using it after it got expired and never received renewed card. Any idea on “hdfc internal guideline e1002” ? Something negative on my profile ? My last tax filing was for 14.4L and when I file in June it would be above 18L. I got a lifetime free upgrade option for Regalia first which I missed to apply last Aug.
Is shifting my salary account the only way to get this card? The RM asked me to cancel my money back card and apply a fresh regalia first through her and then get a free upgrade to regila 6 to 12 Months down the line. Reluctant to do it.